This installment of the Everyman Minis-series clocks in at 11 pages, 1 page front cover, 1 page editorial, 4 pages of SRD, 2 pages blank, leaving us with 3 pages of content, so let’s take a look! So, what is the Gculcilite, apart from one of the hardest to fluidly and correctly type monsters I’ve ever reviewed? We, the creature is the critter seen on the cover, a chaotic neutral diminutive fey with the shapechanger subtype that clocks in at CR 7. The swift creatures are capable of perfect flight, and have an array of both spell-like abilities and sorcerer spell-casting prowess. They can assume the shape of objects and get ½ HD to discern the abilities of natural creatures capable of reproducing, and the fey may engage in a 1-minute ceremony that establishes a parental bond that is both mentally and physically younger than adult, being capable of maintaining up to Charisma modifier such bonds. The pdf also includes a new unchained bard bardic masterpiece, the Nostalgic Lullaby, which is basically a twist on the gculcilite’s age regression trick, though one that thankfully caps at 2 age categories, though that does increase at higher levels if you have accompaniment, and maintenance of performances etc. is codified tightly. The monster also comes with advice on how to use it, as well as some cool notes on how they behave etc. Editing and formatting re very good on a formal and rules-language level, I noticed no serious hiccups. Layout adheres to the two-column full-color standard of the series, and Jacob Blackmon’s artwork rocks. The pdf has a single bookmark that points to the end of the SRD, but it needs none at this length. 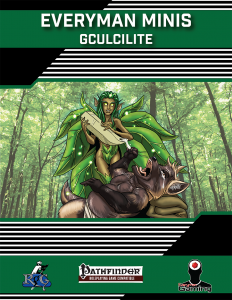 Alexander Augunas’ Gculcilite is AWESOME. This creature oozes adventuring potential and may be a kickass benefactor, a puzzling foe, a fey that represents a ticking clock to save kids from, a non-evil and downright odd being, a means to change the gears of a campaign, an option to unlock Childhood Adventures in an ongoing campaign – and more. this is an excellent, cool critter, and well worth 5 stars + seal of approval. Missed the unchained bard? You can find it here on OBS! The excellent Childhood Adventures can be found here!